Peter Jackson' Lord Of The Rings trilogy doesn't hit theaters until Summer 2001, but that shouldn't stop you from boning up on the Tolkien classic now. Thanks to Shorty's leave-no-hobbit-unturned overview, you can now appear smarter than the kids that will be waiting in line in their Gandalf masks. Don't forget to check out RTC's Pocket Guide To The Lord Of The Rings, and The Lord Of The Rings Casting Call. Lay out your epic in a trilogy format. There is something balanced and almost mystical about the number three. People will think you are deep. Part One - Introduce the characters and set out on the quest. Part Two - Things tend to go rather poorly for the heroes. Split them up and end on a down note. Part Three -The heroes' darkest hour, and yet a glimmer of hope remains. Resurrect some ancient practices and save the day. The "main" character(s) should be little more than locals  everyone like to see the Everyman win. He, she or they should also have some strong  if unknown  connection in the past to the larger events of the world. Usually this involves a relative. A powerful heirloom might be handed down to the one(s) about to undertake the quest. The intrepid band of heroes should be lead by a wise old lore- master (possibly with mystic powers) who should "die" at the end of the first part. He is allowed to show up later in the story either because he did not actually perish or he can walk the earth again as a wisdom- imparting phantom. To really drive home that "down note" at the end of Part Two, take one of your favorite characters and either kill him (her) off or leave him (her) in such a state that their ultimate survival in the future is VERY much in question. In other words: BIG CLIFFHANGER ENDING. 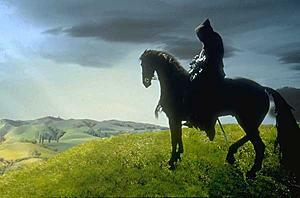 New Line Cinema's official website for the new Lord Of The Rings films. Probably the best source of Tolkien information, artwork and the inside scoop on the current status of the new films. The same director who brought you Fritz the Cat and Cool World brings you the Middle-Earth epic, at least through most of The Two Towers, since he ran out of money on the project. Like the Basinger / Byrne stinker, this one is a combination of live-action and animation. Dir. By Jules Bass / Arthur Rankin, Jr. This animated version of Tolkien's children's story that set the stage for the Lord Of The Rings by telling of the finding of the Ring features many famous voice talents including John Huston as Gandalf. 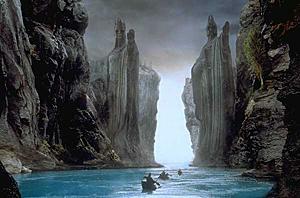 Bass and Rankin are back with the ending of the Lord Of The Rings saga. (This one along with the Bakshi film should tell most of the story.) Once again they enlist top-notch voice talent like Roddy McDowall and Casey Kasem. (Though it is slightly disconcerting to hear Shaggy coming out of the body of Merry.) Both animated stories are excellent but they suffer slightly from being developed by people caught up a little too much in the peace, love and flowers of 60s sentimentality.